If there was any desire to appear fair and balanced, why would PBS the Commission on Presidential Debates choose Gwen Ifill as the moderator for the Vice Presidential debates when she has a book about Barack Obama coming out soon? Are there no other spokespersons who are not openly aligned with one candidate or another? One can only imagine if John Corsi, author of the Obama Nation, were proposed as the moderator for the debate. Heads would be exploding at the very thought. John McCain is more trusting than I am. He said in a recent interview, "I think that Gwen Ifill is a professional and I think that she will do a totally objective job because she is a highly respected professional." The original question I posed still applies. Why would PBS anyone make such an inopportune choice? Mainstream Media is finally becoming sensitive to charges that the media is biased. The recent discussion by MSM talking heads where they discussed that perception on the part of the public shows their complete puzzlement that the public would find their slanted coverage as reflecting bias. Perhaps like a fish having difficulty comprehending the idea of "being wet", much of the media is so solidly of one political persuasion it is difficult to envision any other way of viewing events. UPDATE: After watching the first hour of the debate, I saw no sign of bias on the part of Gwen Ifill. She seemed to be scrupulosly fair and balanced in her handling of the Vice Presidential candidates. On the other hand, Joe Biden kept flashing her a knowing smile when he wasn’t speaking as if to acknowledge that he was on good terms with her. Sarah was polite, but played to the camera and the audience and answered only those parts of the questions she wanted to answer. Both candidates were persuasive speakers. This entry was posted in 2008 Presidential Campaign and tagged Gwen Ifill, Jerome Corsi, Joe Biden, Obama Nation, Vice Presidential Debate, VP Debate. Bookmark the permalink. 0 Responses to What were they thinking? I am unaware of the process of choosing a debate moderator. Was this PBS’s choice or was it some general choice by the participants? I had read somewhere that having Ifill as the moderator was something that both the Obama and McCain camps had a say in. Any info you might have on how this works would be enlightening. It was a PBS choice. 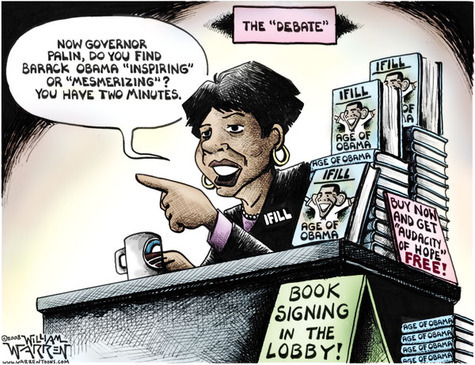 Ifill’s book was not known to the McCain team when McCain’s team accepted her as moderator. After the news came out, McCain said he feels she will do a professional job. I hope so, but it was a poor choice on the part of PBS to choose someone who would gain financially from an Obama victory. It shows a marked lack of sensitivity and ethical presence on their part. This lack of judgment on the part of PBS has only served to confirm the negative view that many have of this organization. From what I could find about Ifill’s book, which admittedly isn’t much, is about politics and race. Hmm, Colin Powell is listed. He’s still a Republican, right? So this supposedly “pro-Obama” book isn’t really about Obama so much as Black politicians and their future. Obama is the first Black man running for President. If you were writing a book about Black politicians coming to power, would you ignore Obama? And if you were writing this book and included Obama, would that necessarily make you biased in Obama’s favor? Is it possible to have different political views from Obama and still acknowledge that he’s something of a history maker? Also, from what I could find, Ifill has been writing for some time. How is she suddenly biased and “in the tank” for Democrats now? I’m curious where you got your information about how biased she is. Considering how you’ve been writing about getting your information directly from the source, I’d like to know how Ifill got you to think she was so biased. Everything I find that indicates she might be either says she most definitely is (by right-wing writers) or that the proof is in the pudding by everyone else. From what she herself says, she dismisses such claims of bias and refers to her previous work. I agree that the fact she has this book and needs to interview Obama to write it might make her biased, but I think the problem might be more that she will be familiar with Obama and won’t ask good questions more than I worry that she’ll start throwing curve balls at Palin. Speaking of Palin, her recent interview with Couric was a bit more candid than her speeches, which I would think would give an even better insight into her character than a pre-written speech. Any comments on how that interview affected your admiration of her, or was it just the liberal media making her look bad in your point of view? A correction: Obama isn’t the first Black candidate running for President, but he’s definitely still making history. Ifill’s book is focusing on Black candidates and their prominence in political offices, and so it still makes sense to mention a world in which children are growing up thinking nothing is special about the fact that a man like Obama is making such a successful campaign run. You seem to be able to nitpick from a biased point of view. Is it really possible or necessary to determine the multi dimensional view of a moderator? How they perform in the role of moderator is something you can talk about after the fact as you did. It could be totally mechanized without a moderator. Something like Who’s smarter than a 5th grader (without a host). The question could be faceless audio with closed caption. If the candidate is not answering the question they get buzzed or the microphone gets shut off, same thing if they run over time limit. A more enlightened opinion about debates in general was what Don Hewitt (producer of the very first TV debate Nixon vs. JFK). Yes, his fame is more tied to 60 minutes and that’s not always perfect. But his point was that the debates aren’t debates in the purist definition. He’s accurate in saying they are joint PR news conferences. That’s difficult to argue against if you watch debates. He also pointed out that debates ARE partisan by definition. Seems obvious doesn’t it? The moderator makes weak attempts to enforce the rules of a real debate so both candidates freely dodge the questions and pitch some talking point of the campaign. I’m guessing you would be looking for some prejudice if the moderator attempted to insist they answer the questions asked. That hasn’t happened in any consistent or meaningful way and that’s why Hewitt claims the modern debates are simply political advertisements. I agree and I’m seldom disappointed when the review of performances is about style, not substance. It’s fabulous revenue for media corporations and isn’t that all that matters anyway? I saw Hewitt on PBS, I think it was Tavis Smiley show. But then you have a problem with PBS in general so you cling to your bias. That’s too bad, you missed a point of view and comments that had nothing to do with political affiliation. My point, which you seem to have missed, is that choosing a moderator who had a financial interest in the success of one candidate was not an example of “fair and balanced” moderation. I do not believe that John Corsi or Rush Limbaugh, or Dennis Miller, for that matter would have been appropriate either. We all are biased to some extent. My bias is to listen to what people say and then to compare it to what they do and then rate their credibility on that. Listening to what other people say they said or did is pretty much a waste of time. Most of mainstream media is a waste of time. That is my bias. Bloggers on the Left and on the Right are more honest as their partisanship is more clearly declared. By comparing coverage by the two groups, I can get the whole picture. I might have missed that “I picked the questions” comment but then I would have to ask who created the list of selections to pick from. I agree with you wholeheartedly about reading or listening to differing points of view but I spend less time on either extreme fringe. I also agree with you about watching and interpreting without any filters. I look for entire transcripts since it’s easy to spin just about anything when taken out of context. My main point would be; Who should determine and select a moderator that is politically impartial and is that realistically possible? I understand that you drew some straight line between her having written a book as grounds for disqualification but I disagree. I didn’t see or hear anything from Ms. Ifil that verified your concerns. We can speculate whether or not she adjusted herself in advance because folks like you had concerns. Personally, I think she is smart enough to have known that in advance. I also agree that it would be fabulous if the words of politics will result in meaningful actions when the opportunity arises. Good Luck with that. I’m certain you and I will be voting.